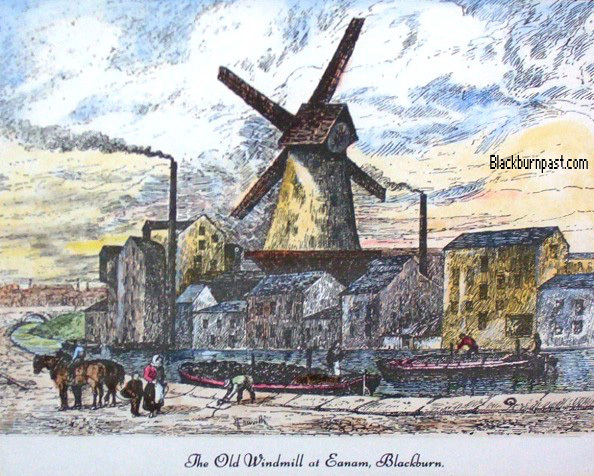 Not a lot of people are aware that Blackburn once had a windmill, but as you can see from this drawing by Charles (Chas) Haworth, we had one just off Higher Eanam. Built in 1822 by Samuel Derbyshire of Audley Hall and the appropriately named John Miller, it stood on the canal bank just a little further on than the Navigation Bridge, which is the bridge that still carries the traffic over the canal to this day. Samuel and John had bought the land from the canal company for £160, no doubt a small fortune in 1822. The canal itself was still relatively new, having only opened through Blackburn in 1816 and although it's hard to believe today, nearby Copy Nook was back then regarded as being on the outskirts of the town. I've no information as to how much it cost them to build the windmill, but they sold it to John Polding (a corn dealer, who had premises on Darwen St) in 1829 for £1,450. He operated the windmill until his death in 1862 and then his son carried on the business for another 20 years. It was then converted to other uses and stood without its sails for a few years, before finally the huge round tower itself was taken down in the late 1880's. If you look on the section of the 1929 O.S. map below, you can get an idea of where it was situated. As you can see, on Dock Street, next door to the Alexandra Picture Palace/Theatre, there was a business (marked green) called Windmill Works. On the corner of Dock St and Higher Eanam (marked red) stood the Millstone pub, no doubt another reference to the one time presence of the windmill. In fact I'm sure I read somewhere once that a circular millstone lay abandoned in that vicinity long after the tower had been removed. To give you some perspective of where we are, the building(s) marked 'Warehouses' are what most of us refer to as Eanam Wharf and the building (marked blue) on the end of Higher Barn St is the former Globe Hotel. (the other pub marked blue is the long gone Fox & Goose). INFO COURTESY OF J.G SHAW & WILLIAM HULME (1889) AND CP. MAP SECTION COURTESY OF THE ORDNANCE SURVEY AND AERIAL PHOTO COURTESY OF GOOGLE MAPS. It’s a nice painting Colin, I’ve only ever seen it in Black and White before. And a nice illustrated piece as to the whereabouts of its location to go alongside it. I assume the Navigation Bridge would be the one in the distance in the painting. Or are we looking in the opposite direction towards Eden St and the Paradise Bridge? I believe it is the Paradise Bridge in the distance. The artist would have been in the vicinity of the Navigation Bridge. I've now added a Google Map aerial image and I reckon the windmill was situated somewhere between the canal and Dock Street (not sure if Dock St was there at the time of the windmill though) and along the stretch of the canal between the Navigation and Paradise bridges, where the light coloured roofs are in the centre of the aerial photo. The clues suggest it was there too. For instance the Windmill Works is along that stretch on the OS map and the Millstone pub was very close by, on the corner of Dock St. Historians have always reckoned that Chas Haworth got the windmill a bit out of proportion to the other buildings, they don't think it was as large as he makes it look. PS - The drawing is the exact same drawing as the black & white one. The coloured versions were hand tinted in the 1940's or 1950's from what I can gather. I have just three of Chas Haworth's drawings in colour and they're now all on this blog (Livesey Old Hall and The Old Market Place being the other two). The only other coloured versions I've ever seen, where in Samlesbury Hall, though I'm sure there must be more around. Thanks Colin, the Google Map has helped me to roughly place where the windmill was situated. I have to agree with your theory that the windmill is out of proportion (As is part of the canal in the drawing) but in my opinion it doesn't really matter it's still a nice drawing and makes the mill the main subject in it. There was a fatal accident at the windmill as reported in the "Blackburn Alfred" in 1827 when a certain Anne Proctor the Sister in Law of the owner Mr Braithwaite was killed when she inadvertantly walked into one of the windmills moving sails while trying to find her Brother in Law. Thanks for the info John ! Good evening,my aunt Grace is Charles Haworth's great-grandaughter ( she is 85 years old ). Anybody can tell me who was his wife maiden name ? I looked on ANCESTRY and it is not mentionned.He also had two brothers, who are they ? One of my cousin has his carved cane has a souvenir . I would appreciate if someone knows something. Thank you, LORRAINE . That's interesting. If you're local (Blackburn area), perhaps the reference library might have some information. I know very little about him myself. I've just seen his drawings in books etc over the years.